by Mark DeYmaz. Jossey-Bass, 2007. Pastor Mark DeYmaz leads a diverse congregation with people who have roots in more than thirty nations. DeYmaz knows of what he speaks when he teaches congregations how to create and lead churches to do the same. Part one offers the “Biblical Mandate” to seek diversity. This includes Jesus’ prayer for the church, the Antioch church, and Ephesians 3. Together they provide the theology for a multi-ethnic church. 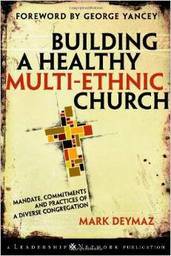 DeYmaz next offers “Seven Core Commitments of a Multi-Ethnic Church.” Here his discussion includes topics such as “dependence,” intentionality, leadership, “cross-cultural competence” and relationships, and inclusion. The third section of his work focuses on enacting his theory and process with three kinds of congregations: church plants, those in decline, and those that are homogeneous. Stories of his own pastoral experience with diversity are sprinkled throughout. DeYmaz’s beautifully written and user-friendly work is for Christians who want to understand and enact diversity in the church.